A smell and sound of the miso soup boiling away on stove. Mum’s cutting vegetables on chopping board. All busy herself in the morning to feed us a beautiful nourishing breakfast. This is a home feeling that comes to my mind in a minute when I think of my mum, home and weekend morning. All the details that others cannot perceive, but me. There is nothing as nostalgic as the food of home. Isn’t it strange what you eat as a child dictates what you crave when you grow up? What is your home feeling? Oh, maybe I’m getting a bit of home-sick. Miso soup in Korea is quite different to the ones you get at the sushi restaurants here. Korean version has a richer flavour with loads of ingredients in it. Tofu, clam, potato, zucchini, spring onion and mushrooms beautifully arranged and cooked in a large stone bowl. That is the main dish right in the middle of the table for us to share. Mum ladles a soup for my brother and me. I don’t consider myself the pickiest eater, but definitely want to get what I want. More tofu! She gives extra tofu in mine because she knows my taste. We also have a small bowl of rice and kimchi on the side. That’s right. To me, miso soup is the highlight of the meal, not the side. It always calls me when I crave a hearty home meal or should I say, when I miss home. It is a simple dish to make, trust me. All you need is rice, vegetables, miso paste and vegetable stock. A great way of using up the veggies in your fridge! I seasoned and roasted chopped veggies in the preheated oven (200) for 15 minutes until they are cooked al dente. Boil miso broth in a pot and cook rice (I used a quinoa and bean mix) in another pot or rice cooker. 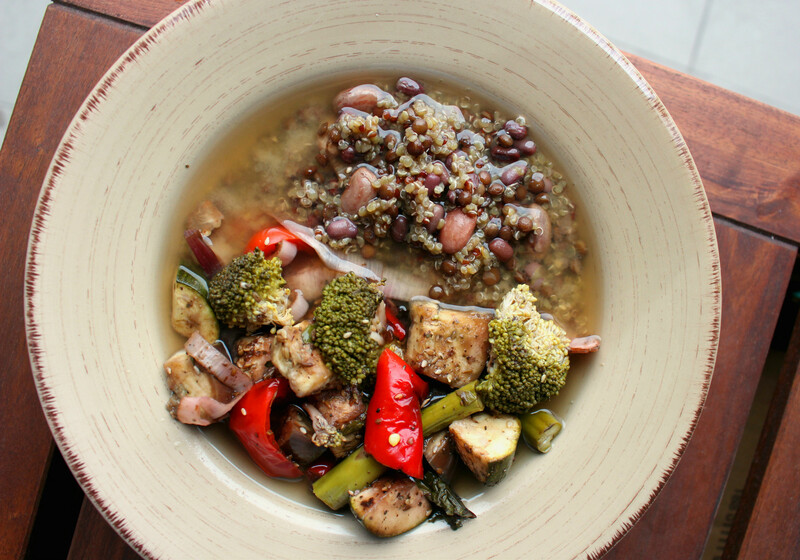 Serve rice and roasted veggies in a bowl, and ladle the soup around it. Garnish with toasted sesame seeds. Serve warm.